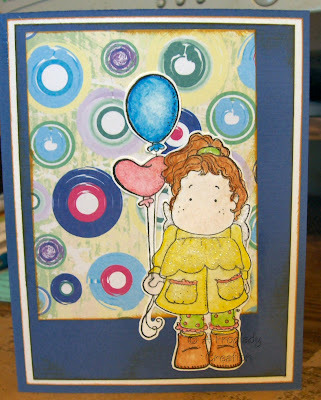 Stamping Stuff: Tilda with Balloons! I needed some birthday cards for friends so I got out my new stamp that I finally broke down and bought - a Tilda one :) She seemed just right with her balloons! I just love these Magnolia images - they are adorable. I have tried to color them with my Copic's as I have seen others do but I get better results when I use my colored pencils. They are softer and look more blended. I need to keep practicing with the Copics. This is also my entry for Cute Card Thursday's challenge :) Birthday Cards. Fabulous card, I love how you have coloured Tilda. This card is very nice! I love the image and the colours!